You do not use da- when talking about a person. You use a personal pronoun. How would you say these in German? Dada or Dadaism – Dadaismus – was an artistic and literary movement that was founded in Zürich, Switzerland in 1916 as a reaction to the atrocities of World War I. The movement lasted until 1924. Dada paintings, poetry and performances were often satirical and absurd, often using boring everyday items like maps, water fountains, wrappers and train tickets and calling them art. One of the founders once described how to make a Dadaist poem – cut out the individual words from a newspaper article, place the words in a bag, then shake it. Once the words are jumbled up, take out each word and copy them out in the order they left the bag. 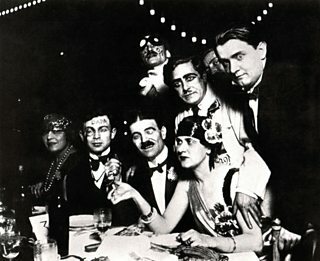 The influence of Dadaism soon spread to a number of other European countries and also to New York, and became a precursor to the surrealist movement. Unsurprisingly, the name Dadaism is not thought to have any meaning.